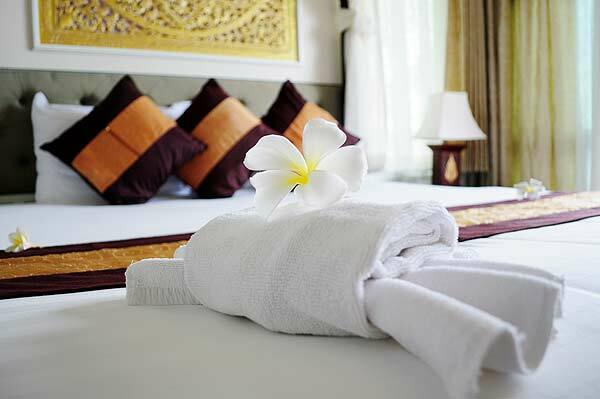 Buy nice linens specifically for guest use, and have them placed on the bed for easy access to add a luxurious touch. Depending on your guests’ needs, a full-size bed may be too limiting, especially if a couple may often be sharing the room. “A queen-size bed is typically the most practical,” says Lori Weatherly, who owns a New York City-area interior design firm. There’s nothing worse than making the guest room an afterthought, with old sheets, a threadbare blanket, and pillows not up to par for your own night’s sleep. Wait for linen sales and stock up on new supplies – an assortment of pillows (flat, fluffy), a light and heavy blanket, and good-quality linens. Resist the temptation to break out this brand-new bedding when you fall behind doing laundry and need clean sheets for, say, your daughter’s bed. “The linens, extra blankets, and pillows should be used just for the guest room,” Weatherly says. They won’t look worn and will always be at the ready when you have an overnight visitor. How to make your visitor feel like an imposition: Leave no space in the room’s dresser drawers or closet. “You should consider where your guests will put their belongings during their stay so that they don’t feel like they’re living out of a suitcase,” Weatherly says. Make space by temporarily relocating your things to the basement or another room. Be sure to supply some sturdy wood or plastic hangers – those flimsy wire ones from the dry cleaners just won’t do. “If you want to encourage them to spend time in the room, install a TV, but if you want to encourage your guests to join the household, forget the TV, and have some good magazines or books available for late-night reading,” Weatherly says. Lighting is important in every room of the house and no less so than in the guest room, where visitors may like reading in bed before calling it a night. “Try to make the room as resolved as the others in the house, not a catchall for items that have no other home,” Weatherly says. That means the floor should be clear of boxes, bikes, and anything else that a guest wouldn’t use so there’s space for things like shoes and backpacks. De-cluttering the tops of bureaus and dressers will give them room for wallets, phones, and other personal items. The nightstand should hold a few essentials that address the guests’ comforts – a lamp, alarm clock, small pitcher, a glass for water, a box of tissues, and a bowl to hold watches, keys, and earrings. Place a small wastebasket in plain sight.